It can be difficult to estimate the size and weight of any extinct animal such as Spinosaurus, particularly when relatively few fossils specimens have been found (as is the case with Spinosaurus). There can be some doubt about how to reassemble fossil skeletions. Since its discovery, Spinosaurus has nearly always been rated as possibly the longest and heaviest Theropod dinosaurs, although there have been some scientists who proposed lower estimates. However, even among those scientists who believed that Spinosaurus was the largest Theropod, there has been a great variation among their estimates as to its size. In 1926, Friedrich von Huene estimated that Spinosaurus was about 49 feet (15 meters) in length, and weighed more than 6 tons. In 1982, Donald F. Glut also estimated that Spinosaurus was about 49 feet (15 meters) in length, and weighed more than 6 tons. In 1988, Gregory Paul also gave a length estimate of 49 feet (15 meters) in length, but suggested a weight of around 4 tons. In 2005, a team led by Dal Sasso, by comparing Spinosaurus to Suchomimus, and assuming the same overall body proportions to the skull, gave an estimate of 52 feet to 59 feet (16 to 18 meters) and 7.7 to 9.9 tons. 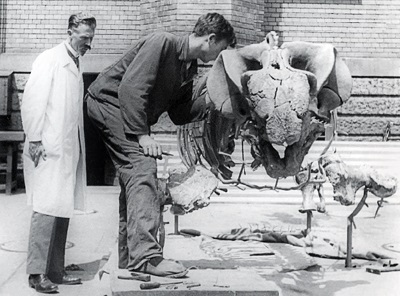 Other scientists however criticized this work because of the underlying assumptions, and because the skull length that they were working from was itself uncertain. In 2007, François Therrien and Donald Henderson, also using comparison with animals, came up with an estimate of 41 feet to 47 feet (12.6 to 14.3 meters) and 13.2 to 23.0 tons. This study was however criticized because some scientists felt that its choice of Theropods for comparison was less than ideal. In summary, then it's hard to be precise with estimates for Spinosaurus's size and weight. We know the animal was large and massive - but knowing exactly how large and massive requires further scientific research, and, most likely, discovery more fossils.